March is upon us, which can only mean one thing… basketball, basketball, and more basketball. 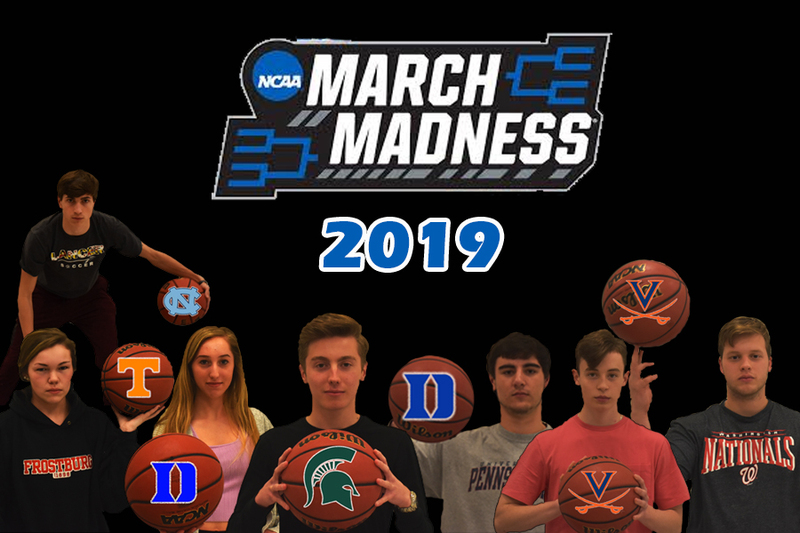 Seven journalism students are competing to see who is the best at predicting this year’s Division 1 Men’s College Basketball national tournament, or as most people know it, March Madness: Jacob Bolger, Matthew Gelhard, Braden Weinel, Ethan Hart, Ashley Martin, Bailey Spore, and Madeline Williamson. The rules are simple. Each student fills out one bracket. For each game they predict correctly, they will receive points: one point for the first round games, two points for the second round games, three points for the third round games, and so on. After the National Championship game on April 8, the point totals will be added up and the person with the highest number of points will win bragging rights over their fellow journalism classmates. 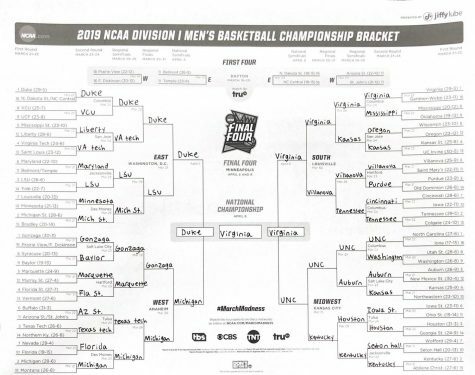 Make sure to follow our brackets over the course of the tournament and play along with us! Here’s how the competitors see their advantages. Braden selected the University of North Carolina to be this year’s National Champions. He selected UNC because the coach, Roy Williams is an experienced tournament coach, leading the Tar Heels for 16 years, and he knows how to guide play in these intense, win or go home games. Freshman point guard, Coby White may be young, but he plays with the confidence of an upperclassman. He also has the ability to change pace with no trouble, which is critical in college basketball. The Tar Heels recently lost the Atlantic Coast Conference championship game to their arch rival, Duke University. We all know that the name, “March Madness” speaks for itself. There are many upsets that occur and end up busting everyone’s brackets. 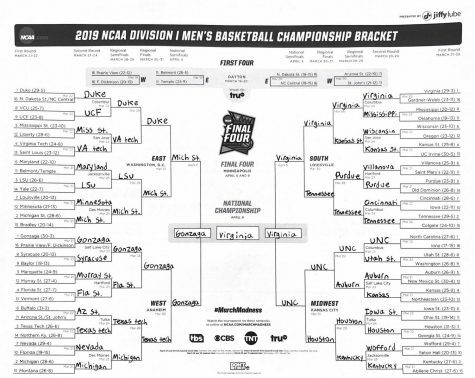 One of the upsets that Braden picked is number 14 seed, Old Dominion University over number 3 seed, Purdue University because he feels that the Purdue Boilermakers fall hard under heavy pressure. Old Dominion is not a well-known school, and this is their first tournament appearance since 2011. Given the fact that ODU does not get many opportunities to prove their skill, they will definitely be gunning for a win in the first round. Madeline chose Duke University to be the NCAA Champions because she thinks that they have really good ball movement during the game with star players who can lead their team to victory. They are a consistent winning team that is coming in as the number one seed for the 14th time in program history. This being their 14th time as the first seed makes them holding the second largest record in history as the first ranked team in their conference. Of course, every year there is an upset game that ruins everyone’s brackets. An example was when No. 16 seed University of Maryland Baltimore County beat No.1 seed University of Virginia last year in the first round. An upset that Madeline chose is Georgia State University, the Number 14 seed beating the University of Houston, the number 3 seed. She thinks that Georgia State will beat Houston because they are coming off of multiple consistent wins that will hopefully carry onto the tournament. Bailey has Michigan State University going all the way. It’s been a few years since a number 2 seed has won the tournament, and he thinks Michigan State will break that streak this year. The past few years, Michigan State has made it to the Elite 8, with the exception of 2016 when they lost in the first round. Bailey made some bold moves this year when considering upset games. 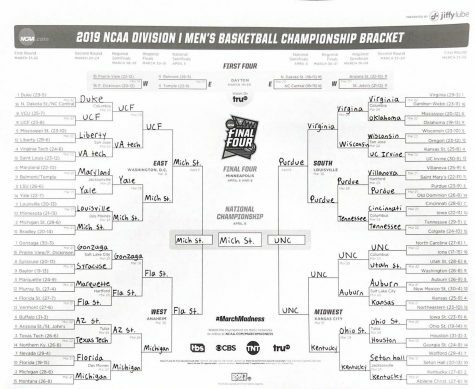 Not only does he have Yale University beating Louisiana State University in the first round, but he also has the University of Central Florida upsetting number 1 overall seed, Duke, in the second round. He isn’t going off stats when making his bracket. He prefers pure luck and guessing. He knows anything can happen, and he’s hoping for exactly that. 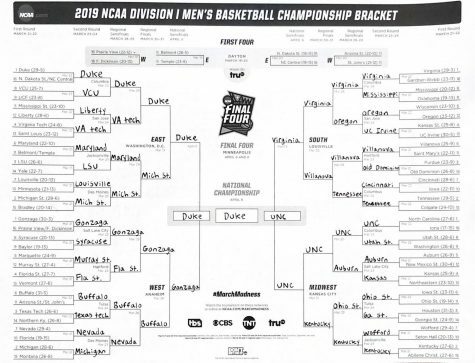 Ethan predicts Duke will their regular season dominance in the 2019 NCAA tournament, winning the National Championship over the University of Kentucky. Duke is powered by star freshmen R.J. Barrett, Zion Williamson, and Cam Reddish, who are all projected to be drafted with the top 10 picks of the NBA draft. Their star power, offensive dominance, and chemistry will overpower other teams that lack the depth Duke brings to the table. 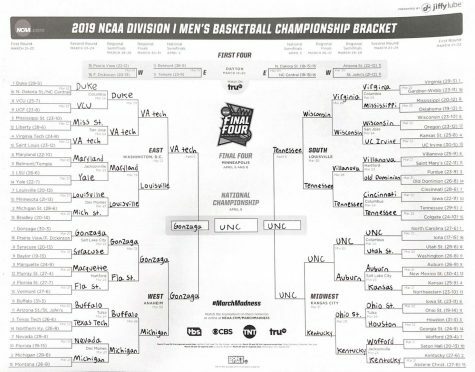 Ethan’s biggest upset pick is Utah State University taking out the University of North Carolina (UNC) in the Round of 32. Utah State is a consistently strong team who has been able to defeat regular tournament-goers such as the University of Nevada and Fresno State University. Theyfresh off winning the Mountain West conference championship. UNC hasn’t been as strong as they have in years past, and have lost against worse teams such as the University of Louisville and Syracuse University. Don’t be surprised to see this #1 seed out of the tournament early. 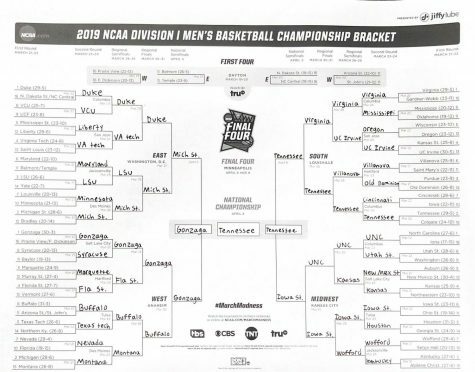 Jacob chose University of Virginia to win the March Madness tournament because he thinks they have a lot of potential. 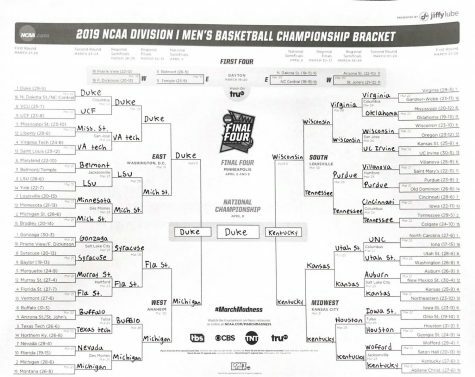 Not many people think Duke would lose to UVA in the championship, but Jake disagrees. He predicts that Duke is overconfident and will choke in the finals. The biggest upset Jake has is Liberty University beating Mississippi State University in the first round. Liberty is coming off a big win and they can hopefully run with their momentum. He doesn’t think there will be many upsets this year, but this is one that Jake thinks is possible. Ashley chose University of Tennessee to be the national champions this year due to the number of improving players–they are hot and getting hotter. Admiral Schofield handles the ball tremendously but recently he has gotten better at his “perimeter game.” He has turned into a very dependable player and shooter in the lineup. Jordan Bone, point guard has created endless shots for himself and others throughout the season. Both of these players create great assets this year for the national championship. Ashley made a big move by putting the University of Montana through over the University of Michigan. She did that because she has a gut feeling that Michigan is going to choke early. The Wolverines are known for doing pretty well in the national tournament each year, but Montana has a record of 26-8, and Ashley believes that they are going to pull off a big upset. Matthew selected the University of Virginia to complete the six game tournament run and be named 2019 National Champions. He believes that the cavaliers have enough experienced players to bring home a national championship. Players like Kyle Guy and De’andre Hunter have been dominant in scoring this season and due to their consistency, Matthew predicts them to go all the way. Matthew didn’t pick a lot of upsets this year. He does not have much faith in the underdog teams this year and predicts that the games will go as supposed to.